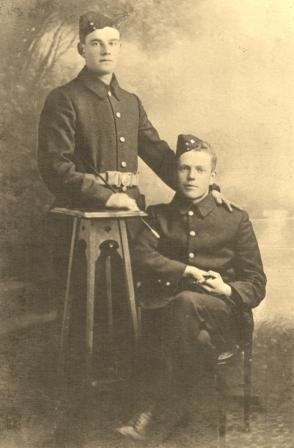 Walter (sitting) and Richard (standing) Allard, born in Barton Turf, both lost their lives during the Battle of the Somme – aged 21 and 23 respectively. There is a ‘Visiting Exhibition’at the RAF Air Defence Radar Museum, Neatishead put together by Neatishead, Irstead and Barton Turf Community Heritage Group. It commemorates the Battle of the Somme which took place from 1st July to 18th November 1916 and has come to symbolise the enormous losses and dreadful conditions of the First World War. Almost every community across the United Kingdom was deeply affected by the loss of men who had gone to fight. 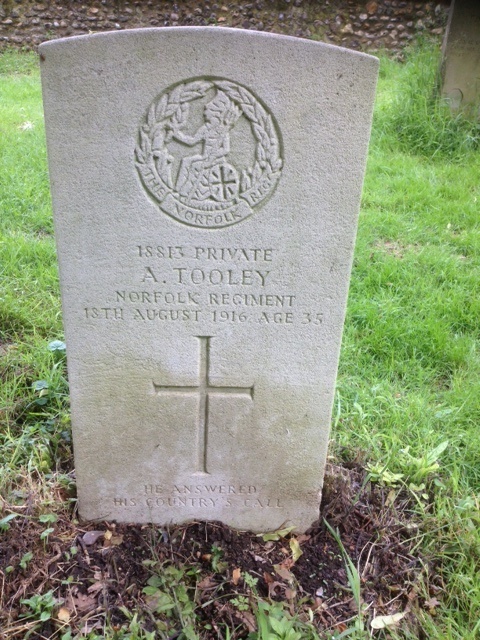 Grave at St Peter’s Church Neatishead of Alfred Tooley who was fatally wounded at the Battle of the Somme. A summary and accompanying maps explain the plans beforehand and the course of the battle. Read about the lives of the 12 men from the villages who paid the ultimate sacrifice together with the Norfolk Regiments’ involvement in the Battle. The exhibition will be there all of August. As the recently formed Neatishead, Irstead and Barton Turf Community Heritage Group (NIBCHG) comes to the end of its first, Heritage Lottery Funded project, the open afternoon on 31st January 2016 saw the launch of its website www.greatwar.nibchg.org.uk. This will make much of the research available digitally and the group hopes may uncover more information. The research has centred on establishing all those from the three villages who served during WW1 in order to provide a permanent memorial for these men and those who paid the ultimate sacrifice. Currently there are 136 men remembered on the new memorial in the New Victory Hall, Neatishead. There are a number of other names who are known to have connections with the villages at that time, but no confirmation has been found that they served during WW1 – this list appears on the website. If you had family living in any of the villages 100 years ago, please take a look to see if you can give us any more information. In addition the project wanted to explore life in the three villages 100 years ago. They were certainly busier places with many more shops and trades, more people working the land and the marshes and more children. This research has been displayed at the events held over the two years and will also be incorporated into the website soon. To complement this research a new Community Chest has been made for the group and contains many artefacts, toys and reading material relating to WW1 and life 100 years ago. It is available for community groups to borrow and explore, and will be also used for the group to give talks. “When I come home” an original scripted drama written by Ray Gedling, presented and performed by the local drama group NABS (Neatishead and Barton Society) and NIBCHG, told the story of two sweethearts, Betty and Davey, born and brought up in a Norfolk Broadland community. Davey is a sensitive and conscientious agricultural worker; Betty has a wonderful simplistic naivety with a warm and positive nature and has been protected from the harsher realities of the world. She sees David’s decision to go to war as wonderfully romantic, and she is blissfully ignorant of the barbarity of what he is subjecting himself to. Their story is told out in letters they exchange during their time apart…… This moving performance was a poignant reminder and typical of the life of many young sweethearts in rural villages across the country. As Neatishead, Irstead and Barton Turf Community Heritage Group www.nibchg.org.uk comes to the end of its first project, it will now become a permanent local interest group in the villages and hopes to undertake more locally based heritage projects in the future.